We’ve made many trips across the southern end of the Sea of Cortez between the Baja Peninsula and the Pacific Coast of Mexico, and with the exception of our first crossing all have been smooth sailing. Until now. A few days ago we made the 225 mile trek from Mazatlan to Isla Espiritu Santos, although our mileage was significantly higher than the rhumb line 225nm measurement due to all the crazy course changes we made while dodging storm cells. As I write this we’re siting here in the cockpit looking out over gently rippled water, under a blue sky, looking at the white sand beach and the red rocky cliffs of Playa Bonanza on Espiritu Santos. It’s a view that is familiar and yet it feels new after having been south on the tropical coast of mainland Mexico for the past few months. It’s also a view that reminds us that the challenges of the past few days are definitely worthwhile. We’ve paid some more dues to the sea gods who guard this slice of paradise and hopefully we’re now paid up for a very long time. To really appreciate the trip we just survived, let me try to give you a visual of Happy Dance making the crossing with her crew tethered on and enduring the ride. First you’ll need to go into your laundry room, fill the washing machine and start the agitator. Drop in a toy sailboat with two little lego people duct taped to the deck. Now close the lid and turn out the lights. It’s dark in there right? Yep, really really dark. Now leave the lights out, open the lid and aim bright flash light bursts all around our little Happy Dance and her crew. With the first light flashes, bang a pan a few seconds later, then start banging the pan as loud as you can immediately after the flash of light. Now get a watering can and pour cold water over our little Happy Dance with the little lego people duct taped on. Now get a fan and point it at our dancing toy boat, turn it on and off and change the direction of the wind from minute to minute. Are you getting the picture? Yep, it was that crazy. Now hold that visual I’ll try to fill you in on the actual details. After watching the weather forecasts for a week, we’d decided that there was a good opportunity to boogie over to Baja in moderate 8-15 knot northwest winds with a low swell, beginning Friday and ending Monday, when another strong northerly was expected to blow down into the Sea. We pulled off the dock Friday at 10:00am on a rising tide under cloudy skies, exited the narrow channel to be greeted by a zillion rays jumping with joy, and multiple pods of humpback whales breaching and slapping. The wind was blowing 8-10 just off the bow; not hard enough to make much speed under sail alone, so we motor-sailed on our rhumb line close to the wind. A lovely start to a two day sail. We held this course as day turned to night, enjoying a sliver of a moon that lit our way. By this time we were about 60 miles offshore, the seas had gotten progressively lumpier and more confused, and the wind was beginning to get flukey. Soon the moon went down and the clouds covered the stars making for a very, very black night. When I came up to start my watch at eleven o’clock Marty was looking at the radar and said that a vessel had just appeared on radar about 6 miles out. As we watched a couple passes of the radar that vessel turned into a small island and then grew into a blob about 4-5 miles wide; our first storm cell of the night. Little did we know how many more we’d see over the course of the next 12 hours. Since we were starting to bash into steeper and steeper waves we reefed the main, and altered course slightly to avoid the squall cell and take the swell more on our forward quarter. Marty went below for his 3 hours off watch and I took over, staring into the black and hanging on. As the night progressed, things began to deteriorate. Tiny dots appeared on the radar and literally within minutes they would bloom into large yellow blobs measuring 6-8 miles in size directly across our path. The evil storm cell blobs were traveling south to north at 3-4 knots, and we were moving east to west at 4-5 knots. We tried to dodge the cells by anticipating where they were heading as they grew and changed shape but it was nearly impossible to get through without going through some of them. At one point the cells made a complete circle around us and we just had to pick the narrowest band to aim toward in order to escape. It was like playing a video game, only we didn’t have any zappers to blow up the blobs and they were definitely winning. Evil storm blobs finally 4 miles behind us. Looks benign from four miles away…it wasn’t!! As one group of cells passed us by, we’d get a slight reprieve of 10-20 minutes before the next group would start building. At first the only lightning that we saw was far in the distance lighting up the entire sky, but as the cells grew in intensity we began to see actual bolts of lightning hitting the sea or splitting the sky horizontally, and then we started hearing the thunder; the very loud, rolling, crackling, scary thunder that meant the lightning was getting closer. In the midst of all this craziness, I did have a smiley moment when a large pod of dolphins joined us in the dark. Their paths through the water toward Happy Dance were lit up by the phosphorus, and as they leapt next to the boat little sparkles would light their backs. Oh how I wanted to be a dolphin at that moment, away from the scary weather on the surface! Soon the cells started dropping rain in addition to the thunder and lightning; lots and lots of driving rain. It soaked us and filled the v-berth with rainwater from a river running down from the anchor windlass. The dinghy that was strapped on deck and was soon a small swimming pool with water sloshing back and forth. At one point we were surrounded by a particularly scary cell that just wouldn’t let us escape. This cell was terrifying because it was full of blinding lightning that just kept coming closer. Marty was in the companionway looking aft and watching the strikes of lightning getting nearer; I couldn’t watch and could only cringe as the light flashed around us. Some of the strikes were like clotheslines, with a horizontal line connecting to the sea by numerous vertical bolts flashing down off of the clothesline. I was trying to outrun the worst of it by making a bunch of large course changes as the cell would shift around us. When I heard the thunder I would count it off and turn the other direction, always looking for a hole in the image on the radar screen so that we could make a getaway. At first the count was 8 seconds, then 6, then 2, then BAM; no time to count that one. Yikes! I’ll never forget the sound of the strikes near the boat and the crackling feel of the air around us. How we didn’t get scorched I’ll never know, all I know is that my knees were literally shaking! We finally escaped that nasty cell and kept up the crazy course changes to avoid cells the rest of the night. As daylight dawned we were greeted by the sight of the waves that we hadn’t been able to see all night. I remember thinking that if we were in the dinghy on the face of those waves that we’d just tumble out; that’s how vertical the sides of the waves were. I don’t want to exaggerate and I really have no idea how big the waves were, but because they were steep and closely bunched together it made for a very rough ride. Occasionally Happy Dance’s bow would just plunge down into a trough and as it came up the sea would explode in white froth. We were looking up out of the cockpit to the tops of the waves so the heights were maybe 6′ to an occasional 8+’, and if it hadn’t been a tad uncomfortable, I would have to say that it was truly beautiful; green transparent wave tops and white froth mixing with the colors of the breaking waves as they lit up with phosphorus. Then just when we thought it couldn’t get worse, we found out that yes indeed it could and did; as the cells were now packing more of a downdraft. Bear in mind we’d been fighting this mess for about 8-10 hours and we were both a bit tired; it’s hard to sleep on a boat in a washing machine. As we watched these new daylight cells appear in front of us, the sea would change from a smooth lumpy mess, to a dark gun metal grey covered with angry white breakers. The wind from these new cells was instant and unpredictable, with the anemometer reading 8 knots one minute and 30-35 literally the very next minute. Happy Dance, now under a bare pole, was staggering in the force of the wind with her rigging vibrating, and it was all we could do to stay on course. The waves pushed by these winds were crashing into us and I took a few right in the face; as if I wasn’t already wide awake! Did I mention it was our 10th anniversary of the day we met?? In the face of one nasty squall that was heeling us over in 30 plus knots, we turned downwind to run with it for a bit just to catch our breath. At that point I was thinking that maybe we needed to just give it up and turn back to Mazatlan. We were now at the halfway point, so that meant about 110 miles either way; back to Mazatlan with the wind at our backs, or on to Baja fighting against what now appeared to possibly be the leading edge of a norther. Thankfully Marty and common sense prevailed, and we decided that these mighty winds were localized from the storms and would hopefully dissipate as soon as we reached the other side of the front. In a few hours that came to prove true, and around mid-afternoon it appeared that we’d passed the final cell and now we now just in widespread torrential rain. The sea started settling down and the wind dropped back down to the forecast 8-12 knots from the northwest. Ahhh, we made it. The rest of the passage was thankfully uneventful, and we alternated watches and naps for the second night, motoring into the light wind and increasingly smooth water. We slowed down a bit in order to time our entrance into the anchorage at first light, and soon had the anchor down in paradise as the orange sun rose out of the Sea behind us. 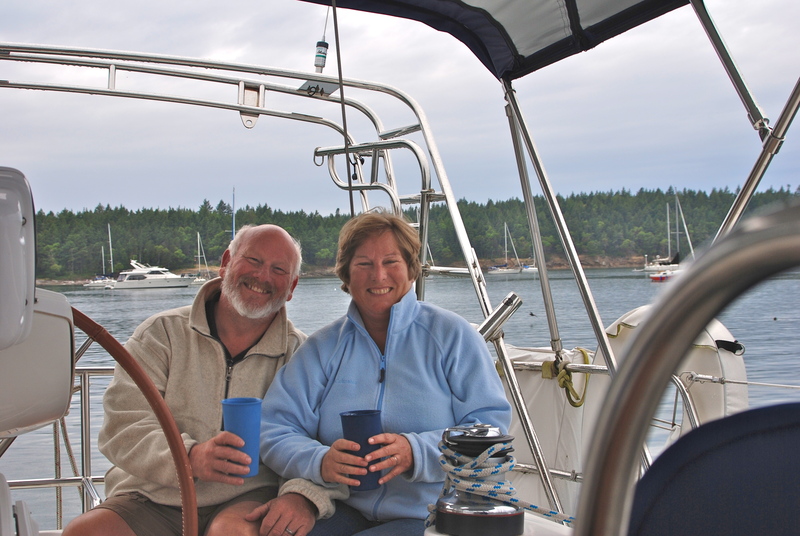 So here we sit, bobbing at anchor, enjoying the beauty of Baja and the clean feel of Baja air. A light breeze is rippling the anchorage, the beach is shining in the sun, and we’ve had a nap, a shower, and a hot breakfast. It’s wonderful to be alive, and it’s a great feeling to be back in the Sea of Cortez. So there you have it, another story to add to our tales of fun, sun, and dubious adventures. In hindsight the storm cells we endured packed winds that were sudden and fierce, and waves that were steep, lumpy, and uncomfortable, but neither the wind nor the sea state were life threatening and Happy Dance is more than up to the task. The only part that was really scary and that I hope never to experience again was the lightning. It was terrifying to be so close to such power, such noise, such hair raising voltage, knowing that there wasn’t a darn thing to be done except hang on for the ride. Thankfully Happy Dance and her crew didn’t get fried and all was well. Wow, there is nothing on earth like the joy of putting a bad passage behind you. Bravo you two – time to relax!!! An amazing journey and life experience! It aged me just reading your note! Take care and be safe!